From left: 2017 NAAA president Jerry Hinton , CEO Frank Hackett and 2018 president Warren Clauss at the NAAA/National Remarketing Conference event in November. Photo by Jonathan Fredin. I had to Google it. (and whatever you call checking “Wikipedia” these days). But thanks to a story I found in The Guardian among other online search results, I now know that the moniker for a 70th wedding anniversary — at least in the case of Britain’s Queen Elizabeth and Prince Philip, who celebrated theirs last fall — is platinum. According to The Guardian, the British duo’s 70th anniversary was on Nov. 20. In a royal coincidence, that was the Monday following the annual autumn gathering of another party celebrating its platinum anniversary this year: the National Auto Auction Association. 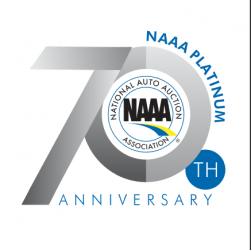 While the closest I get to British royalty is a red beard like Prince Harry’s, Auto Remarketing’s editorial lineup this year will be celebrating NAAA’s 70th anniversary in the most ‘platinum’ of ways. Our plan is for a series of stories, podcasts and special sections that revolve around NAAA, its partners, members, history and beyond. 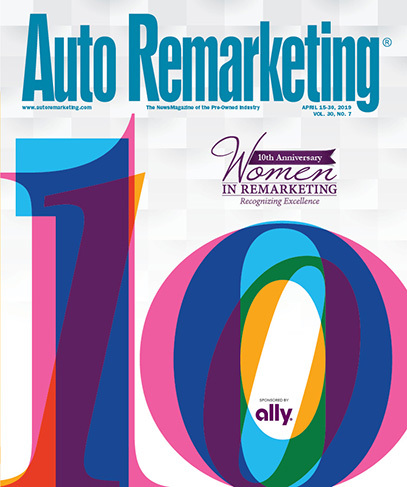 It launches with the March 1 issue of Auto Remarketing and will run up through the NAAA Convention in November, which is held in partnership with our National Remarketing Conference at Used Car Week. For the kickoff installment of the series, we feature Frank Hackett, the chief executive officer of NAAA. I talked with Hackett by phone in February about the changes in the association over his years as CEO, his work and travels with the NAAA leadership each year, auction opportunities for the future and more. So how has NAAA changed from its inception in 1948? “I can’t tell you what it was like 70 years ago — you were around back then, I’m sure,” Hackett joked. But in all seriousness, he points to things like the Warren Young, Sr. Scholastic Foundation as one major measure of progress. “As you start looking at milestones within the industry itself … I just think about little things like the Scholastic Foundation,” Hackett said. “When I think about when I first started here, now it’s almost 14 years ago, they had just started out (with the Foundation) and were looking at, ‘how are we going to raise this money, and how are we going to become self-sustaining?’” he said. The foundation is now self-sustaining, and NAAA has actually raised the amounts provided by the scholarships. For eight of the 12, the amount has been raised from $3,000 to $5,000; and from $2,000 to $3,000 on the other four. Other measures of growth include cooperation among auctions and competitors for safety initiatives like Safe T. Sam, launched by KAR Auction Services. Hackett also pointed to NAAA’s political action committee that was formed in 2012. “We didn’t really have much of a presence in Washington, D.C., but today … I think we’re respected by some members of Congress that know us and hope that those that don’t will get to know us, as we continue to spend time in Washington making friends and trying to find support when we need it when legislation comes up that impacts our industry,” he said. Another big change was merging meetings. For the ninth straight year, NAAA has merged its spring meeting with Bobit Business Media’s Conference of Automotive Remarketing, and is going on three years having merged its annual convention with Cherokee Media Group’s National Remarketing Conference. This, of course, helps save time and money for NAAA members, reducing travel, among other benefits. Each year, the NAAA president is said to have a “theme” for his or her tenure. So, I asked Hackett, as NAAA CEO, what his theme would be. “Training and education,” he said. Part of that has come in the form of a study that NAAA commissioned Glenn Mercer to conduct on the future of the auction business. It was set up so that the study could be completed in seven months in a process that might otherwise take upwards of three years, Hackett said. “So when we say training and education, it’s really giving our members a faster look at the future of our industry, because things are changing so quickly,” Hackett said. Some of results of Mercer’s study were revealed during November’s National Remarketing Conference, with the report being finalized for the CAR event. NAAA also hired Mercer in late 2017 to work on a study about the future of technicians and mechanics. Similar to the project on the future of the auction industry, this study will include folks from inside and outside of the auction industry to help figure out a strategy to help with the challenge of hiring and retaining mechanics/technicians, Hackett said. Part of Hackett’s job is to travel to various auction sites with the association’s president and president-elect throughout their annual tenures. “What we find that’s really valuable is to not only visit the auctions and see the members, but we also spend time with the leadership of the organization, and talking about issues that they have concerns about,” Hackett said. “Like, safety as an example, was an important one,” he said. “We’ll actually meet with the players of the industry, the important leaders that we feel want to kind of get their pulse, too, as to what they feel should be the direction of the association or what’s really concerning them. That’s how some of the strategy and platform items for NAAA are driven — things like finding technicians, the future of auctions and more. NAAA has pivoted from safety mandate to safety guidelines, as they work with the auctions to get their feedback and see what works best for them, given how different each auction can be. “They want to have a menu, and select from the menu, but not be mandated to follow that menu,” he said. Futurist Thomas Frey has spoken a couple times at NAAA Conventions, the latest being this past fall. His message, it seems, is resonating. At least, in some ways, they might. Which, in all honestly, is probably just fine. NAAA’s membership has been reinventing, adjusting and adapting for 70 years and counting.